Join us for dinner and recognition of our graduates! 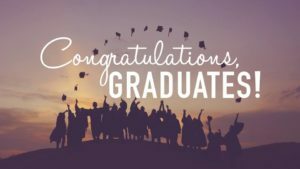 Our seniors are about to graduate and we want our church to know them and encourage them as they finish this chapter in their life. Come dine with us and hear how our students have been impacted by Lake Community Church. Please sign up and let us know you are coming so we know how to plan. Thanks. If you are graduating, please check with Pastor Paul ASAP so we can make sure you have invite cards and information for this event.